Collectors battling the winter doldrums can take solace in this undeniable fact: A hobby heat wave is coming. And it’s coming tomorrow. That’s when Panini America’s 2018 Select Football and 2018-19 Impeccable Basketball arrive in hobby shops across North America. Both products promise to inject a fair amount of warmth into this frigid February with a bevy of collection-making cornerstones. You saw many of those in yesterday’s Quality Control Gallery previews featuring both products. Today, we enter into box-busting Teaser Gallery mode. 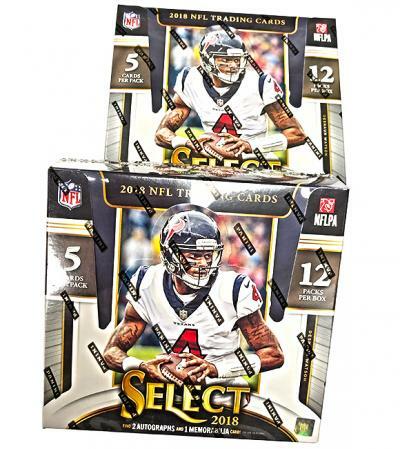 In the must-see imagery that follows, we take you pack by pack through three early boxes of 2018 Select Football. 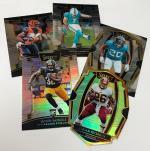 On average, each hobby box of 2018 Select Football (five cards per pack, 12 packs per box, 12 boxes per case) will deliver two autographs (including one Jersey Autograph), one memorabilia card, 14 Prizms (at least five numbered), 30 Concourse base cards, 10 Premier Level base cards and two Field Level base cards. In addition Select’s popular XRC Redemption Cards return at a rate of roughly three per case and the exotic Zebra parallels fall just once per case.